A SWORD & PLANET NOVEL IN THE STYLE OF EDGAR RICE BURROUGHS. The Feroons, a powerful race of emotionless humanoids, kidnapped 40,000 Jennithusians with little effort. Dannus Erekwane—once known as Eric Wayne prior to his death on Earth—has reached the Feroonian Continent with a handful of followers, the few that survived the deadly passage through the Black Straits. But what chance will they have against the masters of this grim land? 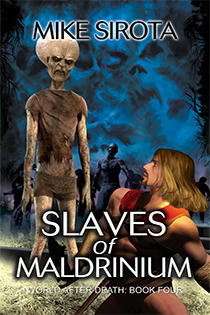 How can they hope to rescue the SLAVES OF MALDRINIUM?